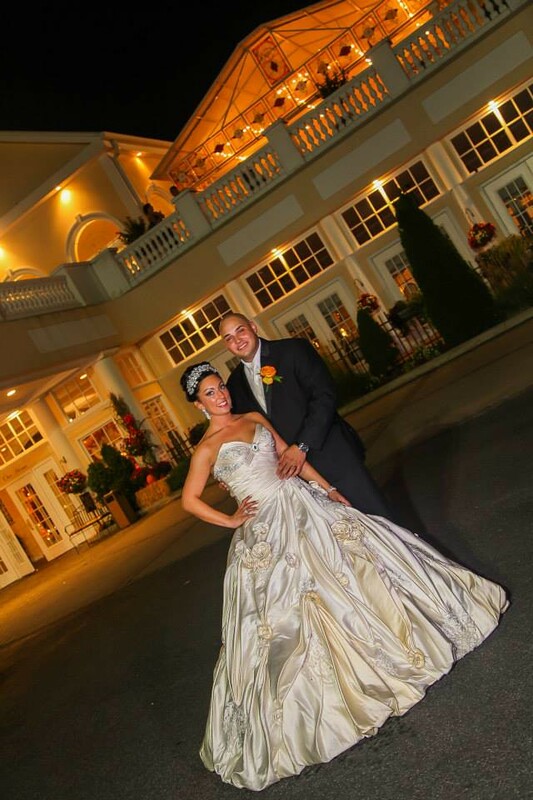 “I had the time of my life during the planning process. I did not find it stressful just a lot of fun. 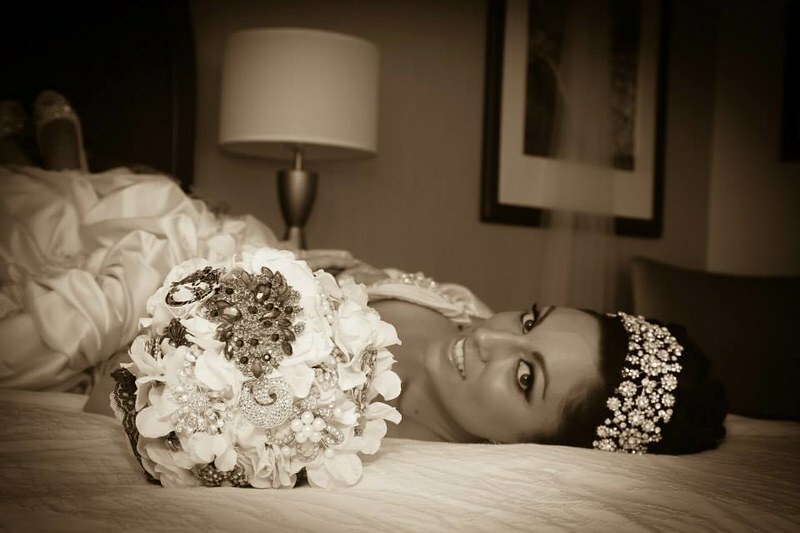 I started about a year before the wedding and every second of the day I was thinking about the wedding. My theme was a romantic fall setting and I just took it from there. My mom Susan was amazing in helping me plan. We did everything together and I must have sent her a million emails. We are both having post wedding depression together. I love her so much and she was so supportive. I also owe so much to my wedding party my sister-in-laws and my mother in law. We are all so close and I was so excited about sharing every detail with them all. It was so nice to have them be excited with me through the entire journey. I love tradition but I put my own twist on everything to make it my own, and they all understood all my visions. I had everyone involved and we all just had a blast planning! 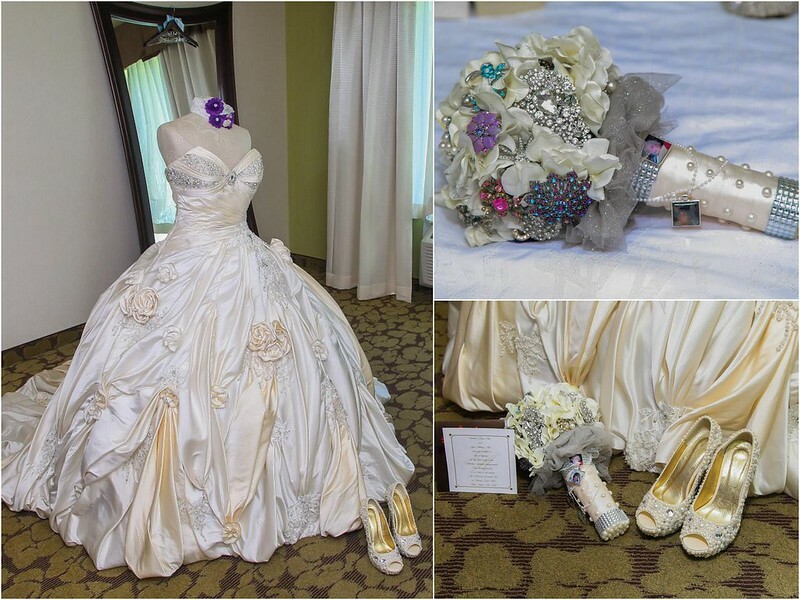 The next stop on Suzanne’s search was to find the perfect finishing touches for her sensational wedding day look at Bridal Styles Boutique! 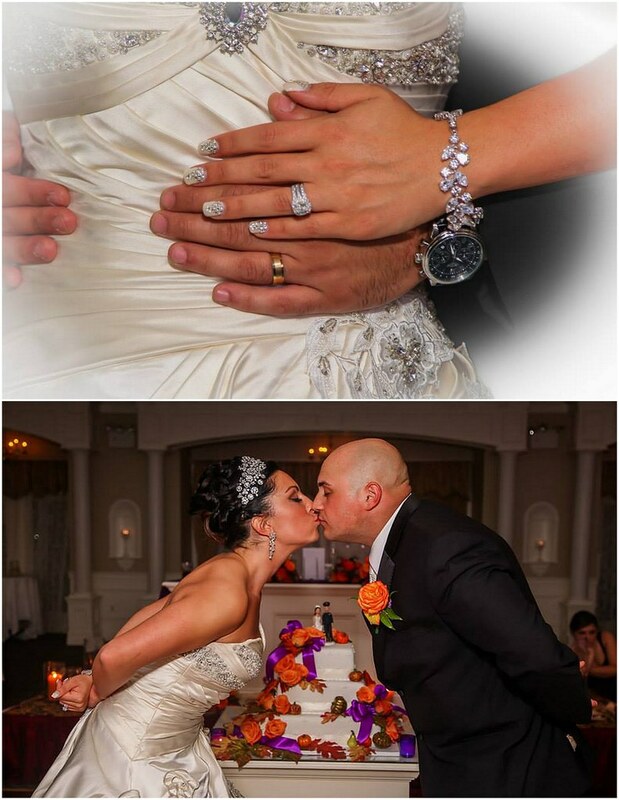 “The wedding day was so perfect. I woke up to the most beautiful weather. 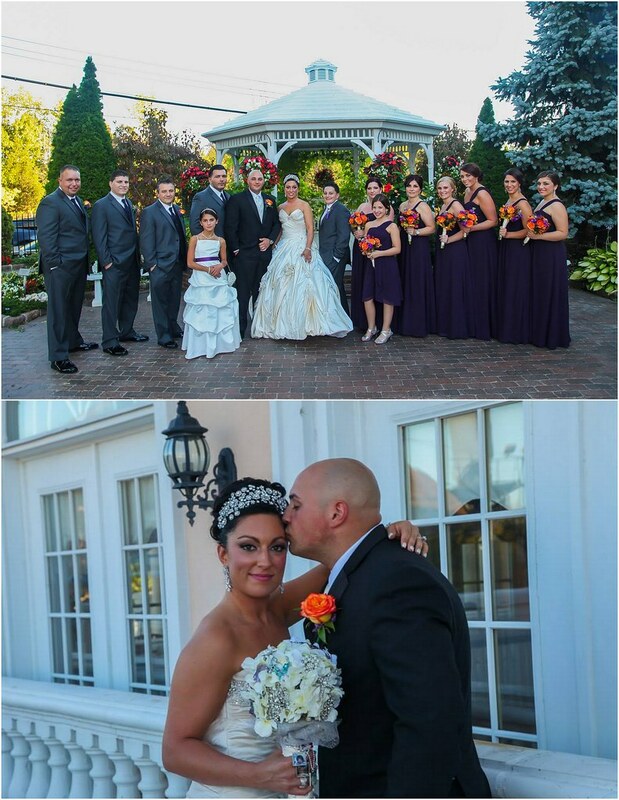 I had my entire bridal party and all of my close family stay with me at the Hilton Garden Inn. We all gathered in my bridal suite. We had such a blast getting ready, it was a time to remember. The ceremony started at 6:20. We were all waiting to walk in and my entire bridal party was in tears. 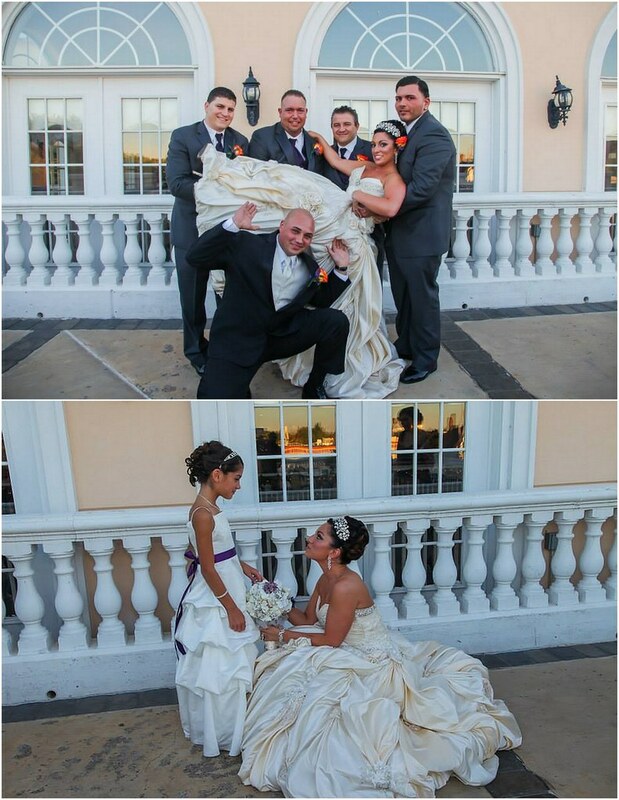 It was very emotional because each and every person in the bridal party took this entire journey with me. We walked in to the instrumental Christina Perry “A Thousand Years” which was also our first dance. 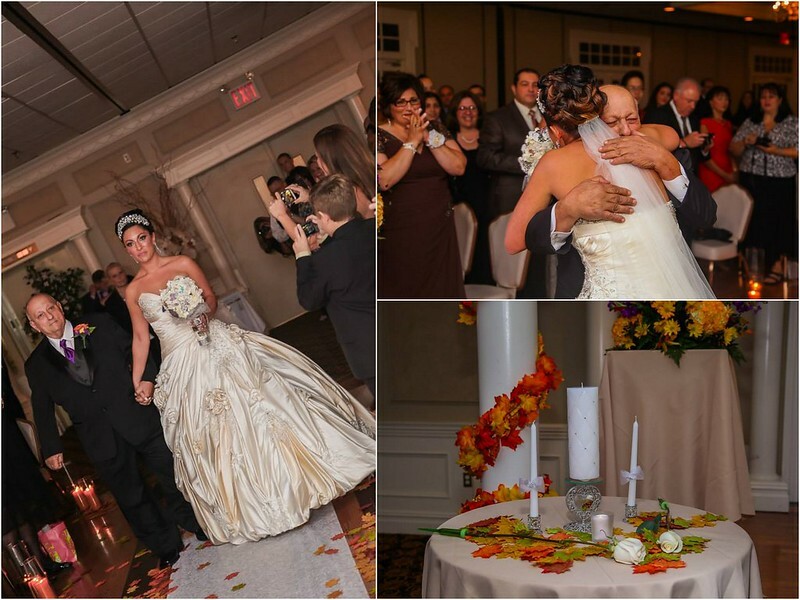 The ceremony was so beautiful with fall leaves and candles lining the aisle. 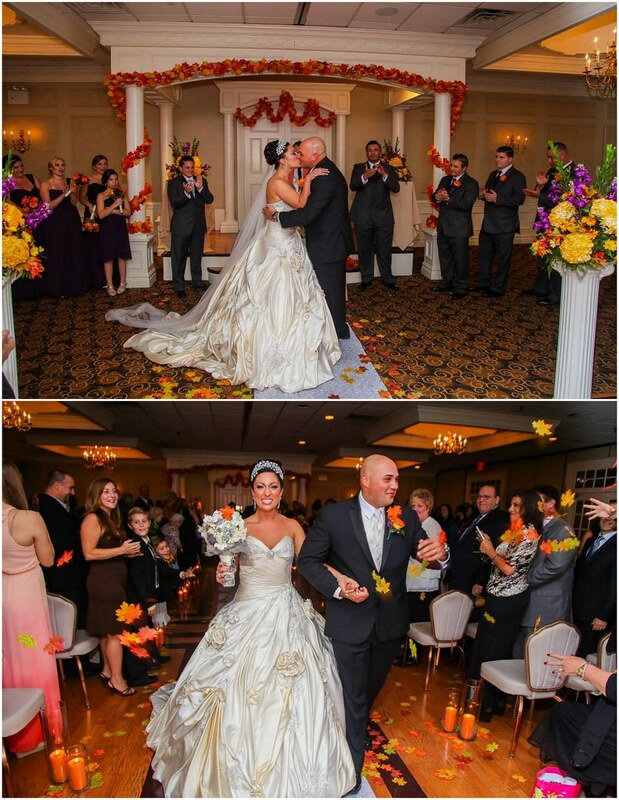 There were also leaves circling the trestle and matching centerpiece flowers on white pyramid stalks. The room was so perfect I was in tears when I walked in. We had a rose ceremony and presented each of our parents with a rose to thank them for giving us to each other. 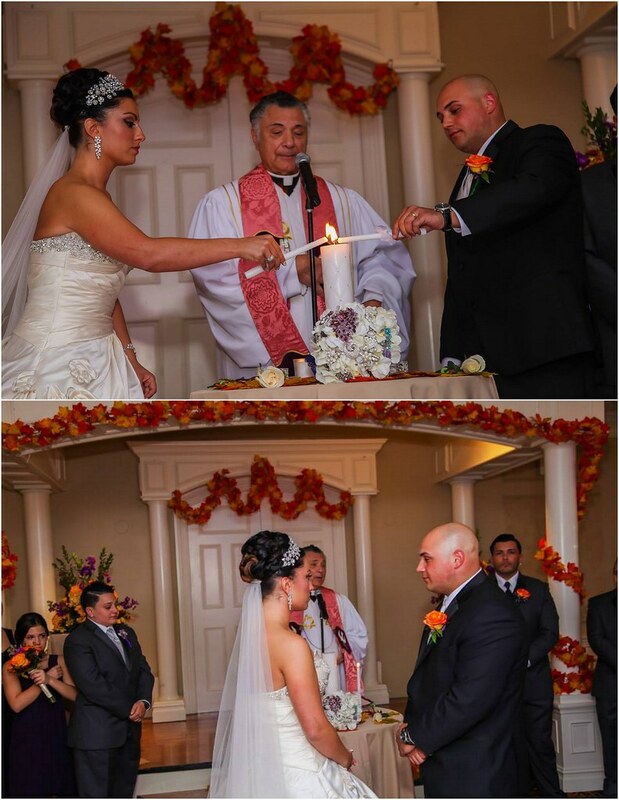 We used the Unity candles, which were lit to the song “Ave Maria” by Andrea Bocelli which meant a lot to my mother. After the ceremony we greeted each one of our guests on the way out and they were escorted to the cocktail room downstairs. This room is so unique because of the architectural work. It looks like a small village and there is also a full mahogany bar. We also came up with two signature drinks which were The Suigi, a caramel apple martini, and also The Falling in Love, an Autumn sangria. Following cocktail hour, the guests were escorted to the reception room on the third floor. From the centerpieces to the elevated dais surrounded with candles and chairs with diamonds on them, the room was perfect. 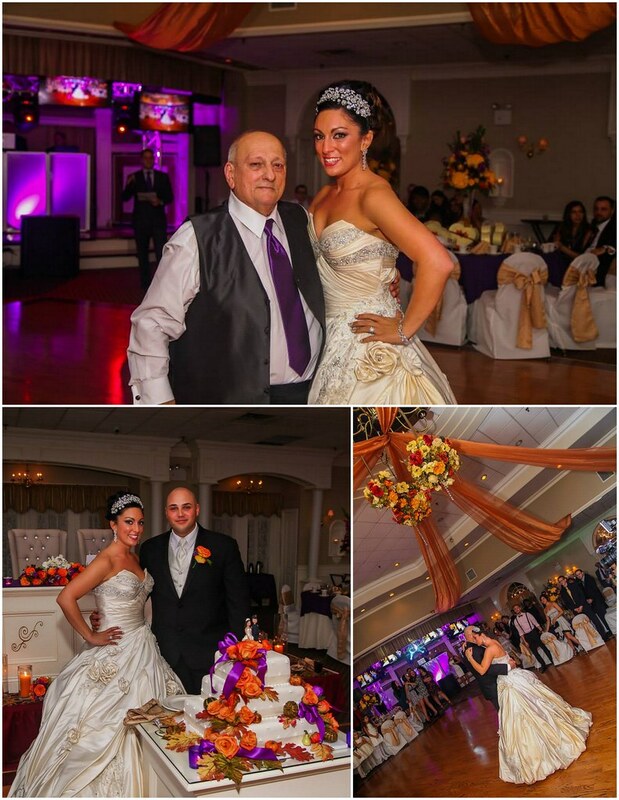 The flowers by Sam Gregorios in Staten Island, New York were so beautiful along with the bouquets. 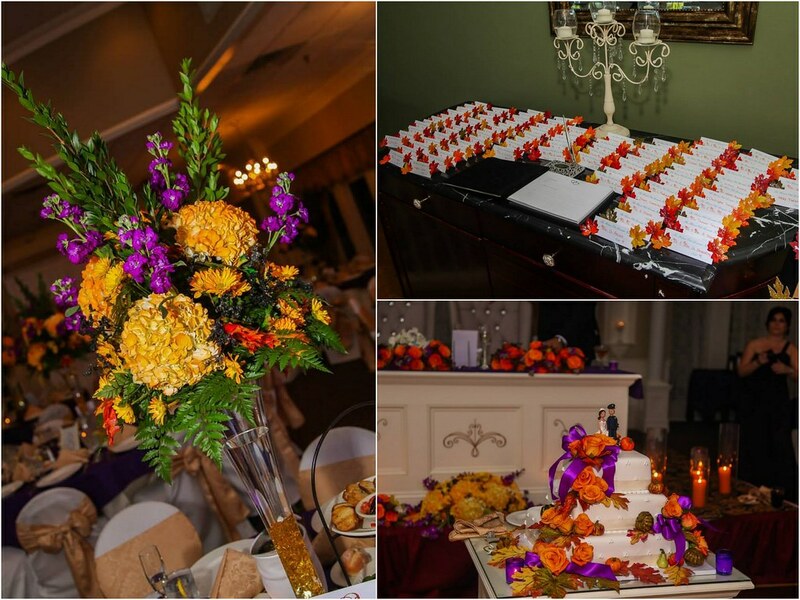 Sam incorporated every color I wanted and even included some sparkly autumn leaves. We also customized the cake and picked pumpkin spice with cream cheese filling. It was beautifully covered with fall flowers and leaves. There was also a cordial station and a coffee station. My mother gave me the last gift my grandmother gave her before she passed, which was a beautiful purple brooch. Loraine Dama, which is Luigi’s aunt, also gave me a very unique brooch. Loraine knew I just finished nursing school and I am very passionate in oncology, so she gave me a brooch that was given to her by one of her patients. It’s an antique brooch, and the woman actually had cancer and was one of her most memorable patients. Loraine also gave me the brooch to take with me when I take my state exam. 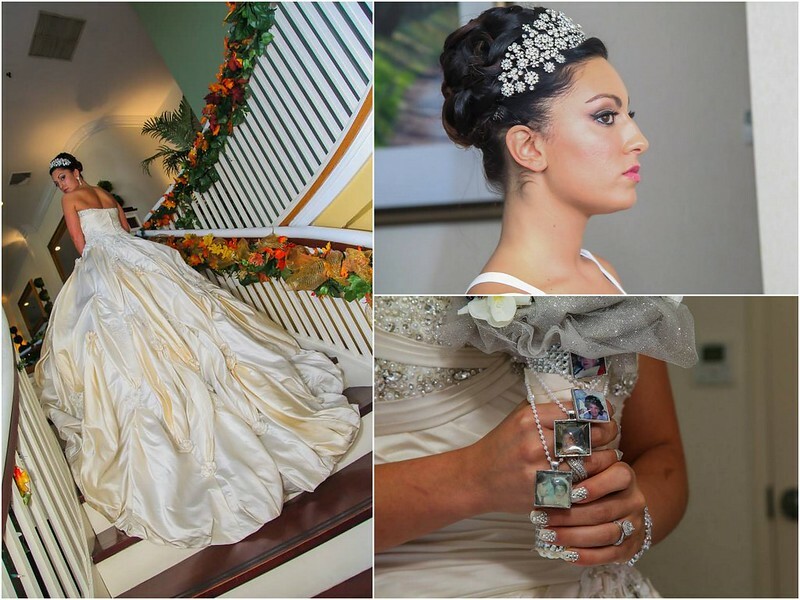 After I completed my brooch bouquet, I took pictures of four very special people to Luigi and I that are no longer with us and hung their pictures from my bouquet. My two grandmothers, Angelina Doino and Mary Weyant, my godmother Denise Scalere, and Luigi’s grandparents, Luigi Dama and Adeline Dama. I also gave my mother and my mother-in-law brooch corsages so they would have them forever. I also wore these amazing shoes covered in diamonds and pearls. I ordered them online and when I received them my mouth dropped. I decided I needed matching flat shoes so I made those also and covered them with diamonds and pearls to match. 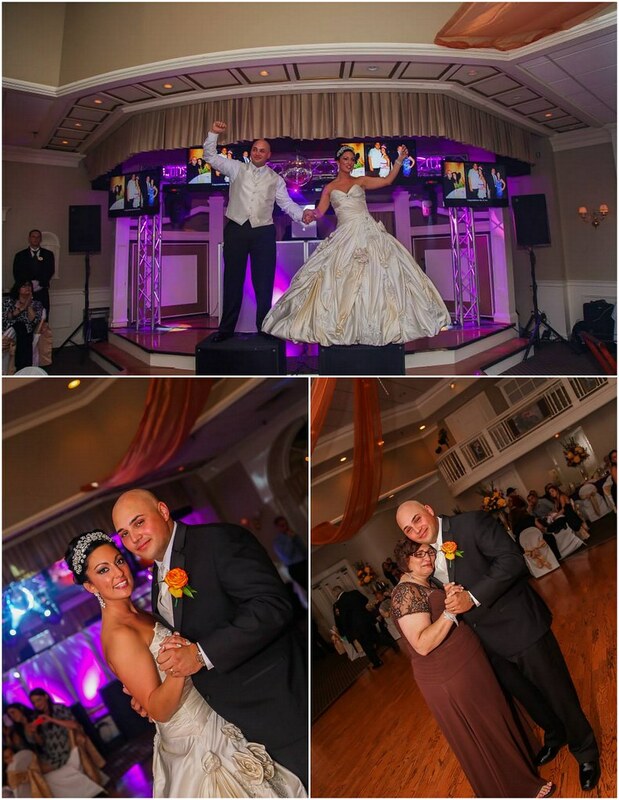 “Luigi says the most memorable moments for him are during the ceremony when we exchanged our vows and when we presented the roses to both of our parents. I actually have three very special moments. My dad (James Cole) was diagnosed with lung cancer last year. My family was not sure if he was going to be at the wedding. So one of my most memorable moments was being able to dance with my dad to Stevie Nicks “Landslide” and to have him dancing like crazy and smiling and laughing at my wedding. I am truly blessed for that moment. The next memorable moment was from my aunt Mary Masullo who is my grandmother’s sister. She had just turned 96, and I had received a reply back that she was not going to make it to the wedding. After Luigi and I were pronounced husband and wife and we were walking down the aisle, I saw her face right in the front. I couldn’t help myself from crying I was so filled with joy! 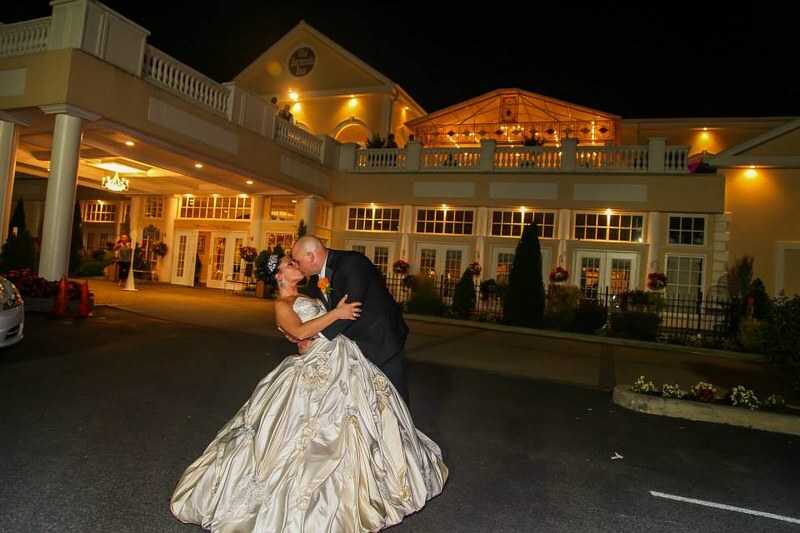 This entry was posted on Wednesday, December 3rd, 2014 at 1:57 pm	and is filed under A Wedding Story. You can follow any responses to this entry through the RSS 2.0 feed. You can skip to the end and leave a response. Pinging is currently not allowed.